Blencathra is one of the most famous of all the Lake District fells, famous for its high ridge walks (most notably Sharp Edge), familiar to everyone approaching the Lakes from Penrith, and the fell that got the most pages in Wainwright's Pictorial Guides. Blencathra isn't quite the first high ground that you reach when entering the Lakes along the A66 (that honour falls to Souther Fell) but it is the top of Blencathra that dominates the early views (and that earned the fell its alternative Victorian name of Saddleback). The fell has two very different flank. To the north and west grassy slopes fall away into Skiddaw Forest, with miles of gentle walking available. To the south and east huge scoops have been cut out of the fell, leaving a series of ridges of varying sharpness separated by steep sided valleys, each with their own stream and one with Scales Tarn. The only grassy breach of the fell's defences on this side is Scales Fell, which splits the rocky front into two isolated parts. The most familiar is the southern face, with the grassy slopes of Blease Fell and Scales Fell at each end and the rocky ridges of Gategill Fell, Hall's Fell and Doddick Fell in between. Around the corner behind Scales Fell is Sharp Edge, a knife-edge of rock that leads to a nasty scramble and eventually to Atkinson Pike and an easy walk to the top. The entire north and western slopes are easy walking so any approach from here is only limited by the effort required to reach the foot of the fell. 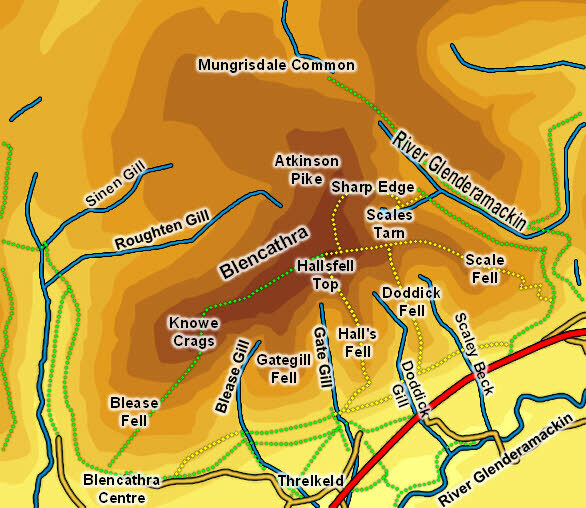 The two easiest regular routes approach from the two ends of the fell - Blease Fell from the Blencathra Centre and Scales Fell starting at Scales. Both of these walks are on steep grassy slopes, near to dramatic scenery but not actually dramatic in their own right. The most famous approach is via Sharp Edge. This involves a walk around the back of Scales Fell and up Brunt Knott to the start of the ridge, the dangerous ridge walk itself and a nasty scramble to the top. On the south face there are several routes. Doddick Fell offers a nice balance between drama and simplicity, following a steep but safe ridge which brings us to Scales Fell near the top. More dramatic is the Hall's Fell route, which ends with another ridge walk, this time over Narrow Edge. Wainwright offers routes up each of the southern valleys and along each of the souther ridges, none of which I have tested. Our ascent of Blencathra climbs the fell via Doddick Fell and descends on Scales Fell. Blencathra has a long summit ridge that runs from the main Hallsfell top west over Gategill Top to Blease Fell. This ridge rises and falls several times. To the north gentle slopes fall away towards Skiddaw Forest, to the south a series of crags and ridges provide much more interest. The views are also very varied - to the south is classic Lakeland. To the west is the bulk of Skiddaw seen side on. To the north are the grassy Skiddaw fells. Finally to the east is the Eden Valley and beyond that the Pennines. Blencathra plays a major part in the course of the River Glenderamackin. The river rises in the valley between Blencathra and Bannerdale Crags, then flows east away from the fell, before making an unexpected change of direction as it flows around Souther Fell, then flows west forming the southern boundary of Blencathra. Just to the south-west of Threlkeld the Glenderamackin merges with St. John's Beck to from the River Greta, which forms the south-west boundary of the fell. Glenderaterra Beck forms the western boundary, cutting an impressive valley. The north-western border is formed by Roughten Gill, which starts close to the summit and flows west, forming the boundary with Mungrisdale Common. In the north the boundary between Blencathra and the Common is rather vague, but Blencathra can make some claim to part of Blackhazel Beck. A number of becks belong entire to Blencathra. On the eastern slope Scales Beck flows from Scale Tarn into the River Glenderamackin. In the south Scaley Back, Doddick Gill, Gate Gill and Blease Gill (from east to west) each emerge from one of the valleys in the south face and run south out of the high ground. Scales Tarn is the fell's only tarn, but it does have a spectacular location below the crags of Sharp Edge.